Training camp is past with the two-a-day practices. There are no more relatively meaningless preseason games. It’s a normal 82-game season. Yes, it’s time to begin the regular season for the Bulls Wednesday in the United Center against the Sacramento Kings. 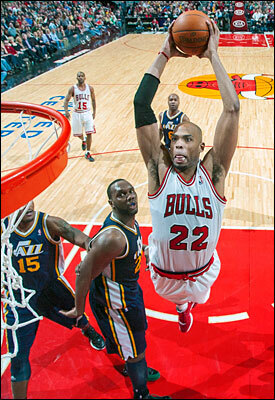 And while everyone is relieved, perhaps no one will be more so than Taj Gibson. Because once the Bulls opening night passes Wednesday, Gibson will either be a wealthier man with a contract extension, or he’ll be a season away from what he believes will make him a wealthier man. In any case, he sounds like a man who’d rather just play basketball. That’s because the Bulls fourth-year bench leader is looking forward to the new season. But all he keeps getting asked about is whether he and the Bulls will agree to a contract extension before the 11 p.m. (Central) deadline Wednesday for fourth year first round picks. If there isn’t an agreement, Gibson would become a restricted free agent next July 1. The Bulls have a right to match any offer Gibson would receive. The Bulls went through that last season with Omer Asik, who eventually signed a contract with the Houston Rockets. The Bulls declined to match given the penal back loaded $15 million third year of the deal. But it’s a very different situation with Gibson. Asik was a second round pick, which put him under terms of the so called “Arenas Rule.” That rule enabled teams to match offers for second round picks for two years at the cap exception. Previously, teams could be prohibited from matching a certain amount money deal to a second round pick. The rules changed so a team wouldn’t lose that player without a chance to match. But there was that loophole of the back loaded deal. It’s not the case with first round picks like Gibson. If he and the Bulls do not agree to a deal, Gibson would become a restricted free agent. The Bulls then could match any offer with no fear of a backloaded big one year but regular annual raises up to 7.5 percent. The Bulls have indicated they would match any offer for Gibson if the two sides cannot agree by Wednesday night. Both seem willing, though that’s also the point of negotiations. Asked on the eve of the season opener if he hopes to sign an extension, Gibson said, “I hope so. “My agent (Mark Bartelstein) and Gar (Forman, Bulls general manager) are still working on it. I have to wait and see. Hopefully, something gets done so I can just focus on basketball. So, someone wondered, what if there is a big deal. How would his agent inform him? “Every morning it’s something new,” Gibson said relating the dawn meetings. “It’s a blessing to be in this position. Not a lot of people can say they have a chance to get an extension from a great team like the Chicago Bulls. I’ve stressed many times I want to be here. (But) there’s only so much I can really do. I let my agent and Gar handle the rest of the business. And it will be done one way or another in a few hours. And then presumably it’s just basketball.